Marking the 150th anniversary of the creation of the Medal of Honor, State Senator Patty Ritchie has joined with area historians to spotlight the 45 local military veterans who have received the nation’s top military decoration for valor. 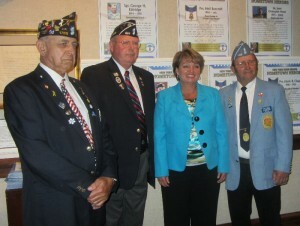 Senator Ritchie is shown with veterans at the opening of her “Hometown Heroes” exhibit, celebrating some of the 45 local soldiers who received the Medal of Honor, the USA’s highest military decoration, now on display at the Jefferson County Historical Society in Watertown. Senator Ritchie’s “Hometown Heroes” exhibit features Medal of Honor recipients from Oswego, Jefferson and St. Lawrence counties, and will be on display at museums across the region over the next several weeks. The exhibit kicked off with a reception Thursday at the Jefferson County Historical Society in Watertown that was attended by historians, veterans, representatives of Fort Drum and military history buffs. Sgt. Jared Monti, a 10th Mountain soldier who died in Afghanistan on his third attempt to rescue a wounded comrade. Senator Ritchie plans to add to the exhibit in future months. The Medal of Honor was commissioned by President Abraham Lincoln in 1862 to recognize soldiers who exhibited extraordinary valor in the war to reunite the union. Fewer than 3,500 soldiers, sailors, airmen and marines have received the decoration in that war and all intervening conflicts and fully one-quarter of them have been New Yorkers — a fact that Senator Ritchie hopes to highlight through the exhibit, as well as her accompanying proposal to rename certain bridges and overpasses in the state for these heroes. The “Hometown Heroes” exhibit is currently on display at the Jefferson County Historical Society in Watertown, as well as the St. Lawrence County Historical Association at Silas Wright House through Sept. 15. It can also be seen at the St. Lawrence Power and Equipment Museum during next weekend’s Old Fashioned Harvest Days in Madrid, and will be on display from Sept. 15 to Oct. 15 at the Halfshire Historical Society Museum in Richland, Oswego County.